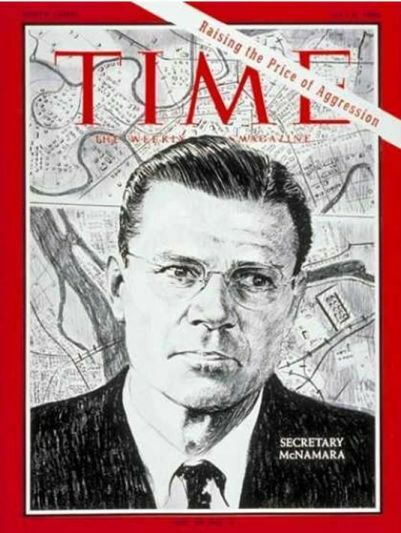 “McNamara’s War” is what a senator called America’s disastrous military invasion of Vietnam. Reading news items about Robert McNamara’s death this week at age 93, I remembered how wide the gulf was between a soldier and the Secretary of Defense, whose exalted place in the chain of command we had to know by heart, when I served in Vietnam in the early 1960s. In 1967, after resigning from the US Military Academy and a military career, I sent McNamara a letter at the Pentagon enclosing my war medals and a protest of the conduct of the war. I never got a reply, although he subsequently had me investigated by the FBI for signing an antiwar statement in The New York Times. For a man who was often in the news with his views on Vietnam and war, it seems McNamara had lots to say to everybody except to the troops who disagreed with what he was overseeing. I’m writing because of your book, In Retrospect. I enlisted in the United States Navy in 1965, and deployed twice to Vietnam, in 1966-7 and again in 1968. I was medically discharged in 1969. Right away I joined an organization called Vietnam Veterans Against the War (VVAW) — perhaps you’ve heard of us. I spent the next three years doing what I could to stop the war, especially working to keep 18-year-olds from being drafted into it. I had some success in the latter and smaller task, but we had none at all in the larger. Disillusioned, depressed and exasperated at our failure to stop the war, I left the country in 1972, returning only when Nixon had resigned. So I read your book with some interest. Of course it told me nothing new about the war’s cost and futility. Nor did it change my conviction that the war we waged in Indochina was a crime. Not a mistake, however deadly and tragic, but a crime. I believe we disagree in that assessment. However, you say you wrote the book because you believe that we — the people of the United States — need to come to terms with the Vietnam experience and its legacy. I certainly do not disagree there. We may not agree exactly what that legacy is. You rehearse a long series of errors in geopolitical understanding and mistakes in the procedures by which decisions were made, and describe a certain amount of wishful thinking. You offer to contribute to our understanding of the Vietnam experience by confessing your mistakes — “our” mistakes, since you served and remained loyal to your presidents and their successors, our representatives in power. A beginning, perhaps. Of course the veterans and victims of your war may be bitter about your late confession. Certainly the illusion that we could have won the war has been important to them all these years. Certainly that delusion needs to be deflated, since it deflects us from the process of understanding, healing and reconciliation. But the delusion that we could have won the war is not the main or central legacy of the Vietnam experience. That legacy is easy to delineate. Our government undertook a war in which there were no military means of accomplishing “our” political objectives. A very large number of citizens realized this, and tried every means possible — mostly constitutional — to persuade “our” government to stop the war. Although “our” government — at least many people in it, including yourself — knew that the anti-war movement was right in its assessment of the war, “our” government fought this opposition bitterly, and finally unconstitutionally. The anti-war movement failed to stop the war. The direct legacy of Vietnam was Watergate. The political tragedy of Vietnam for our country — then and now — is that the anti-war movement failed. This is the legacy you do not address. Our own government was beyond our control. Two issues can illustrate the problem. You write of concern about widespread cynicism and distrust of government. Yet you do not reflect on the consequences of government deceit, or acknowledge the extent to which government deception remains common practice. During the years you remained silent, Geronimo Pratt, a decorated Vietnam combat veteran, was imprisoned in California, convicted of a murder the FBI knows he did not commit. He’s still there. Just as your book was going to press, our government assured Jennifer Harbury it knew nothing about her husband’s capture, torture and execution — but the CIA did know; in fact, their informant did it. These cases are part of the legacy of the Vietnam experience too. There are very many others. You write of the role played by the politicians critical of your war effort, the people we called “hawks.” You and your Presidents feared their political influence, and concocted your war policies to deflect their criticism. You might say that tens of thousands of Americans — mostly soldiers “serving their country” — and hundreds of thousands of Indochinese — mostly non-combatants — died so that Lyndon Johnson (and Richard Nixon) could be President. Ronald Reagan and George Bush used these deaths again to help themselves get elected, and these deaths may yet help elect Bill Clinton’s successor in 1996. Some of the hawks are still in Congress. Their political heirs just swept the last Congressional elections. You have little to say about them, except that some are your friends. But they feed (and feed on) the very delusion of a winnable war from which the rage against you rises, and which in fact you permitted to fester all these years. This is not an issue of Republican and Democrat. There are plenty of hawks and their heirs on both sides of the aisle, and I myself am a veteran of Lyndon Johnson’s war, your war, though I protested against Richard Nixon’s war, and Henry Kissinger’s. It is an issue of democracy and citizenship. I saw American “democracy” in action in Vietnam. I came back to the world and saw American “democracy” at home. The American Legion has demanded that you forego your “profits” from this book. This is a little ironic, since the Legion always supported the war. I myself don’t much like capitalism, but I think that the Legion’s criticism of your “profits” is trivial, though understandable. As you have suggested, it would be a good idea to support an inquiry into the mechanics of the mutual failures of the Vietnamese and American governments to end the war. I’d like to make a different suggestion. The Americans who learned the best and the most from their experience in Vietnam are surely the veterans who have tried to help repair the damage you sent them to do, to compensate for the crime you commissioned. And unlike the programs for Vietnam veterans, where the need is so great that all your profits would hardly be noticed, for activities like the Veterans Viet Nam Reconstruction Project, Project Hearts and Minds, the Veterans Initiative or the U.S. Indochina Reconciliation Project, a little conscience money would make a lot of difference, both to the Vietnamese and to the veterans themselves. I’m no fan of RMN, but to call any part of Vietnam “Nixon’s war” is a bit disingenuous. The Gulf of Tonkin “incident” was a monstrous lie, and I think history shows that Johnson knew it was a lie. And while there were certainly ardent communists within North Vietnam, I don’t really believe that Ho was one of them. He wanted, more than anything, independence from France. We didn’t help him, even though we promised him during WWII that we would. The Russians and the Chinese did provide aid to that end. Vietnam was a failure of our foreign policy that goes all the way back to the Wilson administration and the founding of the League of Nations on the heels of the Treaty of Versailles. Chitty apparently meant to refer to different phases of the war by using the terms “Johnson’s war,” “Nixon’s war,” etc. Johnson was more at fault than Eisenhower, who declined significant involvement, based on military advice; Kennedy, who presided over a minimal involvement and made mistakes but might well have pulled out if he had lived; and Nixon, who took over a full-blown mess from Johnson. I voted for Nixon in 1968 based solely on his (and Kissinger’s) promise that the war would be ended in six months. Stupid me. As it turned out, Nixon significantly expanded the war, and more Americans died under his Administration that under earlier ones. The Gulf of Tonkin Incident wasn’t a lie. An attack of some sort did occur on August 2, 1964, but there’s confusion (then and now) on what actually happened, to include who fired first. There apparently was no attack on August 4, as the Navy initially believed and reported. The picture is further complicated by the fact that the U.S. was involved to some extent, although how much is unclear, with South Vietnamese covert operations on the North Vietnamese coast at the same time. I don’t think there’s much doubt that Johnson and Congress believed that there had been an attack, and the Gulf of Tonkin Resolution was the result. It was a bad idea and shouldn’t have been passed, but the history surrounding it is murky at best. I agree with your last two paragraphs, particularly regarding Ho Chi Minh. It was murky enough that they should not have proceeded based on what they actually knew. That Stockdale was ordered to keep silent about the alleged attack of 4 Aug 64 is problematic. I don’t remember where I read it, but it seems like an issue with the 2 Aug 64 encounter was the Maddox’s proximity to the coast. In any case, I wasn’t aware that Giap had admitted recently to the attack on the Maddox. If Truman had kept the promise made in 1943/44, none of this would likely have ever arisen. But, if my aunt had wedding tackle, she’d be my uncle. Brian, I completely agree that the Tonkin Gulf Incident “was murky enough that they should not have proceeded based on what they actually knew.” Even if the attacks had happened on both days and had been as initially reported, they wouldn’t have justified an open-ended resolution that could be used to justify war on the scale of Vietnam. That, plus continued congressional funding of the war, makes it as much Congress’ war as a war of any one president.